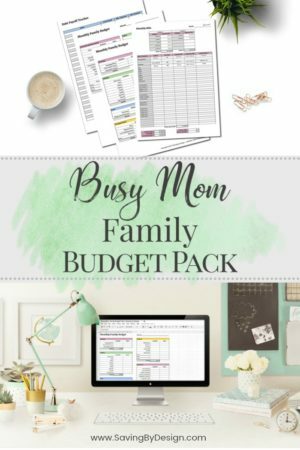 I mean, who doesn’t love to save a ton of money?! 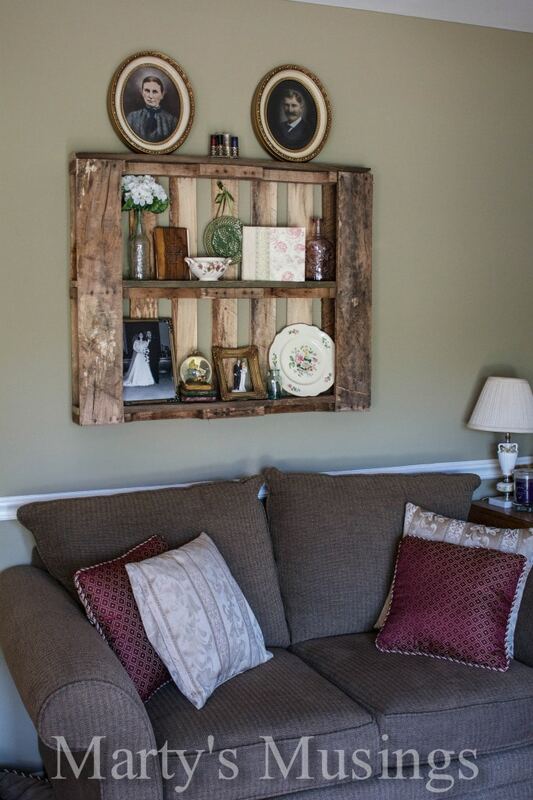 I see all of the amazing pallet ideas every time I turn around and when I find something similar in a craft store or on Etsy, it ends up being a small fortune. And I can NOT justify paying money for something I know I can whip up myself with a little time, patience, and crafting ability! As a Mom who is getting ready to move my sweet baby up to a Toddler Bed, this Toddler Pallet Bed from LoriDanElle.com totally is screaming my name! How unique is this and if you really wanted to, you could paint it any color you would like to match your child’s room. Oh goodness…I’m totally in love with this project! 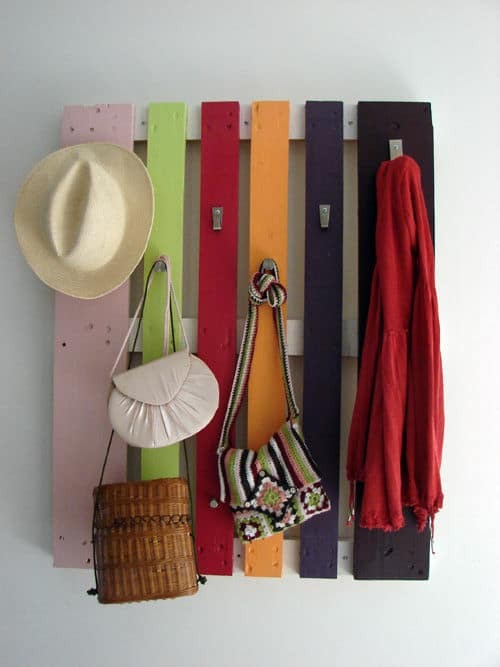 This awesome Pallet Coat Rack from DecorHacks.com can be totally coordinated to match your home. Another great idea to add to this is to use mismatched/rustic knobs on the rack, as well! How awesome would this be in your entryway?! I have been wanting to do a DIY Pallet Wall FOREVER and after getting some brand new inspiration from LittleDoveCreations.ca it just makes me want to start it faster! 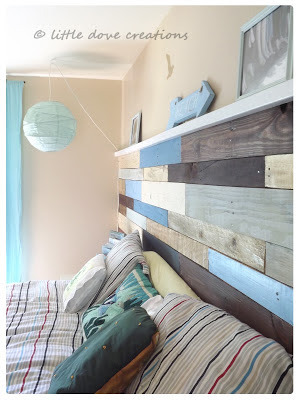 I love this example of making the wall part of your headboard in the bedroom, but there is also the popular pallet wall that I’ve seen with doing a background wall in a half bath. I don’t think you could ever go wrong with this project, though. It’s beautiful! I absolutely love unique tables and benches. This Patchwork Pallet Table from BeyondThePicketFence.com definitely doesn’t disappoint! 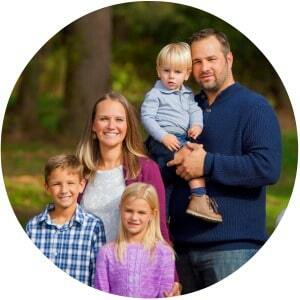 This will take a little work, but the end results…how could you not love it?! 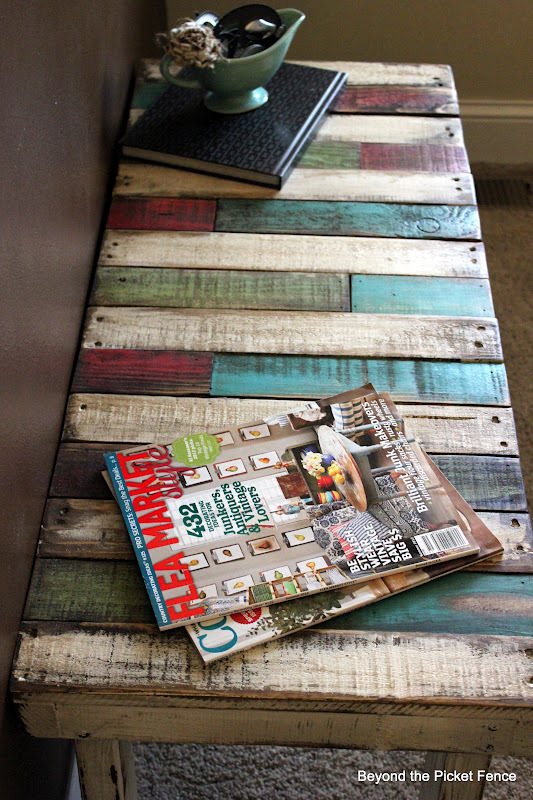 Make it as rustic or saturated as you want and it will fit as a great coffee table in your living room, or even a great bench in your entryway. Perfect! I admit it… I have tried making a Pallet Shelf, similar to the one seen here at MartysMusings.net. The verdict? It looks even better than I could have hoped for! 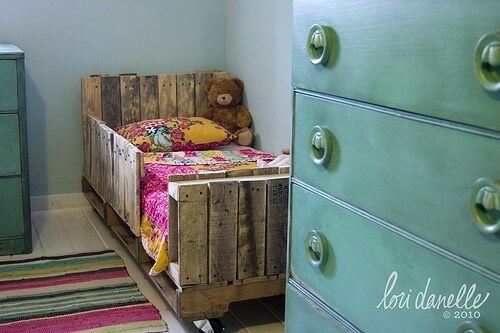 And the great thing is that this project isn’t too time-consuming or difficult in the realm of DIY Pallet projects. 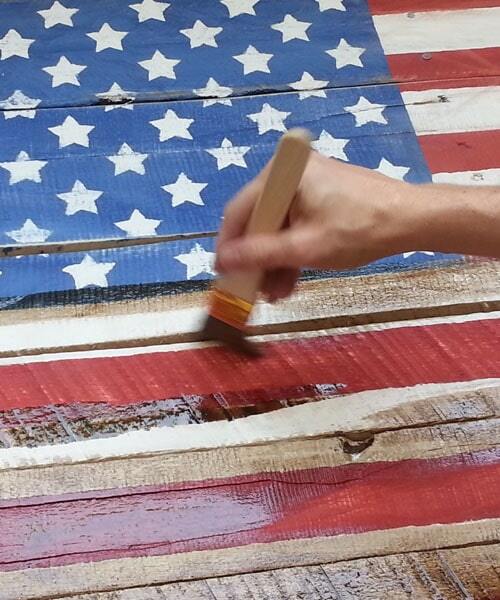 I’ve seen these Rustic Pallet American Flags all over and this example over at PlanItDIY.com is a great one to use for your tutorial! This is one of those projects that I really want to tackle with all my other 4th of July ideas and even put out on my front porch all summer long. It’s such a creative way to display your patriotism and is really a fun statement piece. I love it! 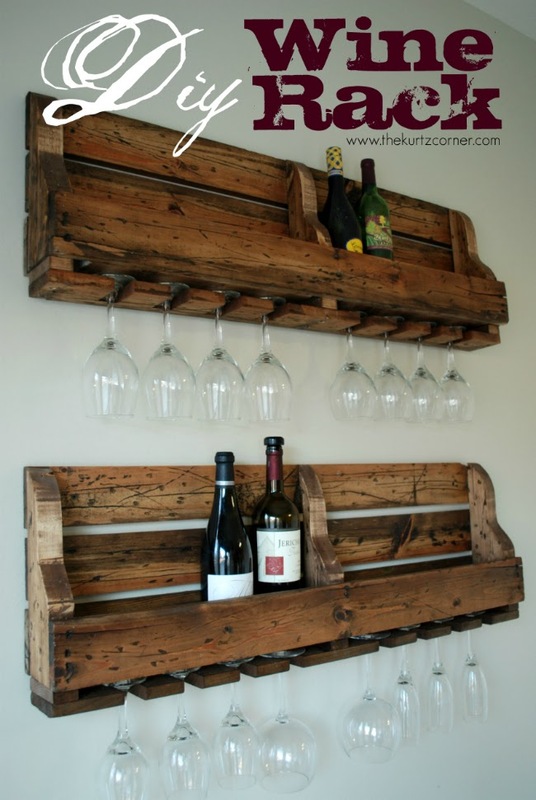 If you love wine and are always looking for new ways to display your bottles and glasses, this DIY Rustic Wine Rack from TheKurtzCorner.com is right up your alley! I’m not afraid to admit that I’ll need a little help with this one, but as long as I can get the hubby on-board, we’re totally going to tackle this DIY masterpiece together! I love the look of signs made out of pallets! 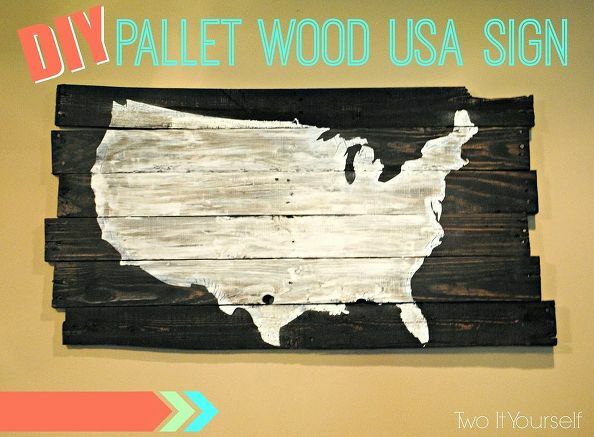 This USA Pallet Wood Sign (which is a Pottery Barn Knockoff) found over at HomeTalk.com is an awesome sign that I’m sure you’ll find a great place for in your home! This specific sign was made from a stencil and I love that you can customize it to be stained, distressed, etc. to wherever your personal tastes take you! OK, now this Jewelry Organizer seen over at PalletFurnitureDIY.com REALLY needs to find it’s way into my walk-in closet! Oh my goodness! And the best news is that this is a project I’m quite confident I can do all by my little lonesome without begging my husband for help! 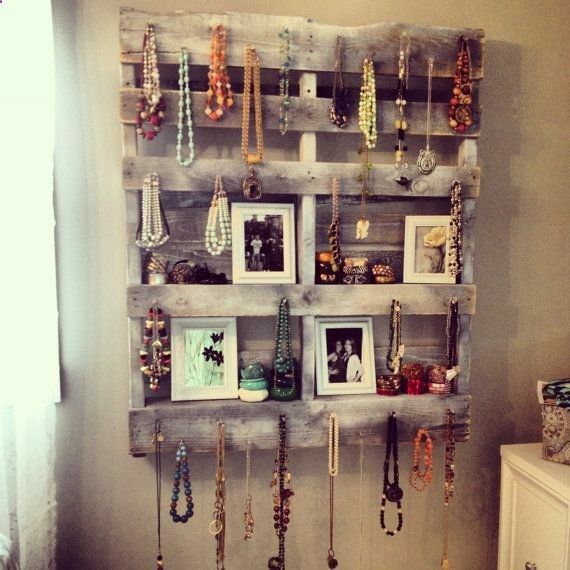 What a great way to display all of your jewelry and know exactly what will match your outfit of the day. Love! 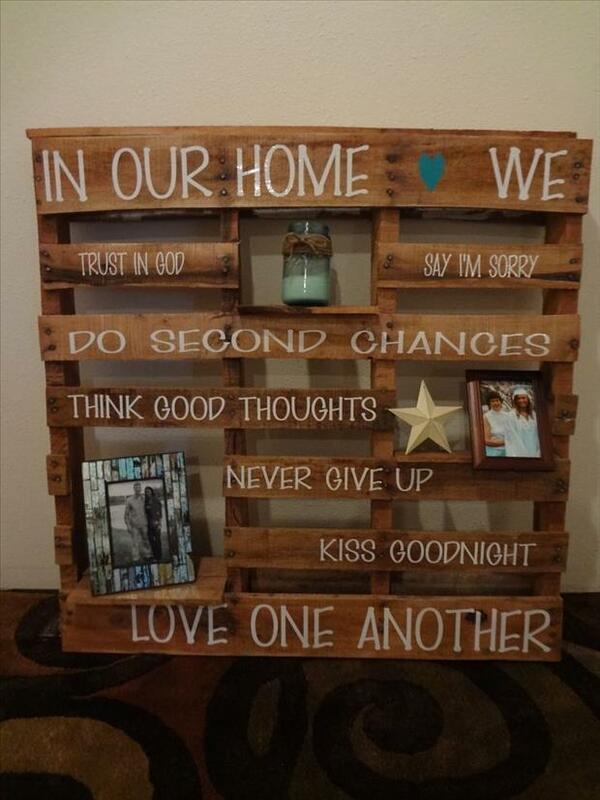 I am a sucker for inspirational signs, so this pallet shelf-turned-inspirational sign from DumpADay.com is so my thing! I love that you can create a few little shelves for that special picture and if this isn’t the inspirational saying that your heart desires, no problem! Find yourself one that speaks to your heart and get to work. I’m not saying all of these ideas are going to be super easy, but they sure will be great decoration ideas for your home, inside and out! And I know that with a little help and sweet talking the right people to borrow some of the necessary tools, I can whip out a couple of these over the next few months.